Civil society organisations welcome the European Parliament’s approval of the new Fund for European Aid to the Most Deprived (FEAD) yesterday, 25th February. This approval clearly shows that the European Union is committed to social cohesion and the fight against poverty. However, there still is much to do before the promised help reaches the most vulnerable. The approval of the Fund for European Aid to the Most Deprived marks the end of long and difficult negotiations. The new fund makes a considerable contribution to delivering goods and support to citizens living in poverty and social exclusion. But, the FEAD should be integrated into wider and comprehensive national anti-poverty strategies so as to maximize its effects at national level. This is the most effective way to make sure that it will complement and not replace Members States’ intervention. The FEAD follows EU food aid schemes created in 1987 to make better use of food surpluses in the agriculture sector. The European Commission proposed to establish a new Fund within Social Cohesion policies, and to place not food but people at the centre of attention. Civil society organisations also welcome the introduction of a broader scope of material and non-material aid to be covered by the Fund. Member states can now adapt to actual needs, choosing between food, clothing, household items, or social inclusion activities (in complement with ESF). 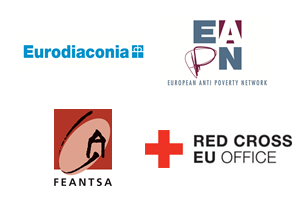 Caritas Europa, Eurodiaconia, the European Anti-Poverty Network (EAPN), the European Federation of National Organisations Working with the Homeless (FEANTSA) and the Red Cross EU Office repeatedly called for the creation of a new fund that involves NGOs at all stages, is simple to implement and properly budgeted. "The excellent cooperation of European civil society organisations throughout the EU legislative process regarding the FEAD has enabled us to develop a Fund which can genuinely meet the needs of local organisations which contribute to poverty alleviation,” says Emer Costello, Member of European Parliament. “The widening of the scope of the Fund to food assistance, material assistance and social inclusion will allow the Fund to target the most deprived in our communities through a wide range of interventions in line with local realities and traditions." While we strongly welcome the FEAD, we call on member states to involve NGOs in a meaningful manner at the different stages of the programming, and to use this fund for the unconditional support of the most vulnerable and excluded, who are further away from the labour market, and to base their actions on the protection and promotion of dignity of each person and their fundamental rights, and in the pursuit of the common good.